The King's College Hospital, Oxford University and OrganOx team pose for a photograph following the successful connection of the first human liver for transplant onto the OrganOx Metra device, in this undated picture provided by the University of Oxford in southern England. LONDON - A donated human liver has been kept alive, warm and functioning outside a human being on a newly-developed machine and then successfully transplanted into patients in a medical world first. A British team of doctors, engineers and surgeons announcing the achievement on Friday said it could be common practice in hospitals across the developed world within a few years, up to doubling the number of livers available for transplant. So far the procedure has been performed on two patients on Britain's liver transplant waiting list and both are making excellent recoveries, the medical team told a news conference. "It was astounding to see an initially cold, grey liver flushing with color once hooked up to our machine and performing as it would within the body," said Constantin Coussios, a professor of biomedical engineering at Oxford University and one of the machine's co-inventors. Currently livers destined for transplant are kept "on ice" in a process which cools them to slow down their metabolism and does not keep them functioning as they would inside a body. This system has worked for several decades, but can also often lead to livers becoming damaged and rendered unfit for use in patients who need them. Surgeons say keeping livers "on ice" beyond 14 hours starts becoming risky, although they can last up to 20 hours. Hepatitis infection, alcohol abuse and drug-induced cholestasis - a blockage in the flow of bile from the liver - can all cause liver failure. Some patients with liver cancer can also benefit from a transplant. Around 13,000 liver transplants are carried out each year in Europe and the United States, but there is a combined waiting list of around 30,000 patients who need a new liver. Experts say up to a quarter of these patients die while they are waiting. At the same time, more than 2,000 livers are discarded every year because they are either damaged by oxygen deprivation or do not survive the cold preservation process. The new technology, developed by Coussios together with Peter Friend, director of the Oxford Transplant Centre, preserves the liver at body temperature and "perfuses" it - supplying it with oxygenated red blood cells to keep it alive. "This device is the very first completely automated liver perfusion device of its kind," Coussios said. "These first clinical cases confirm that we can support human livers outside the body, keep them alive and functioning on our machine and then, hours later, successfully transplant them into a patient." The device can keep a liver functioning normally - just as if in a person, with blood circulating through its capillaries and bile being produced - outside the body for 24 hours or more. The results from the first two transplants using the new technology, carried out at King's College Hospital (KCH) in London last month, suggest the device could be useful for all patients needing liver transplants, Field told reporters. The new device could also mean livers which would otherwise be discarded as unfit for transplantation could be preserved and made viable - potentially as much as doubling the number of organs available for transplant, he said. 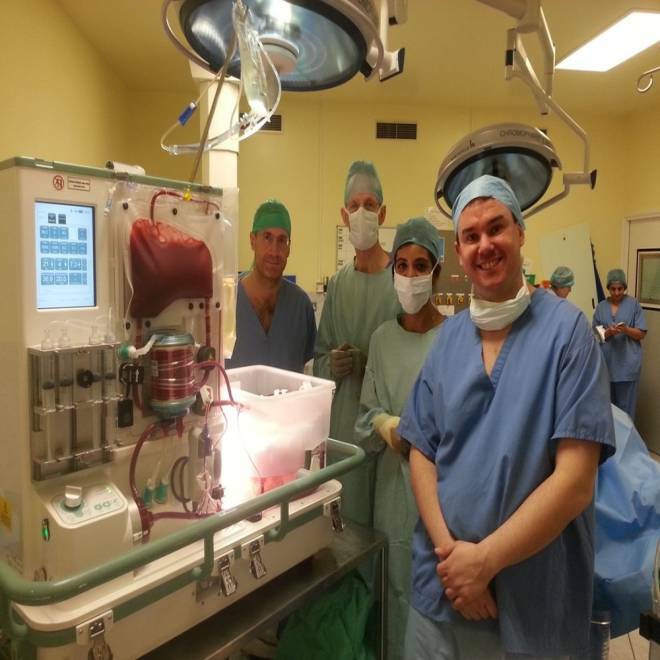 "If we can introduce technology like this into everyday practice, it could be a real, bona fide game changer for transplantation as we know it," said Nigel Heaton, director of transplant surgery at KCH and part of the team that carried out the first two transplants using the device. Coussios and Friend have been researching the technology for the device since 1994 and are developing it through an Oxford University spin-off company called OrganOx. The first person to receive a transplanted liver kept alive on the OrganOx system was 62-year-old Briton Ian Christie. He is still recovering from the surgery but said in a statement he was getting better day by day. "I just feel so alive," he said. Christie was told last year he had cirrhosis of the liver and had only 12 to 18 months to live unless he got a transplant. "I was placed on the waiting list but...I was very worried." Having been through the surgery, he said: "I feel better than I've felt for 10 to 15 years, even allowing for the pain and wound that's got to heal." The team now plans to run a pilot trial with 20 more liver transplant patients at KCH. Coussios said successful results of that trial would allow OrganOx to apply for marketing authority, meaning the device could be on the market by as early as 2014.